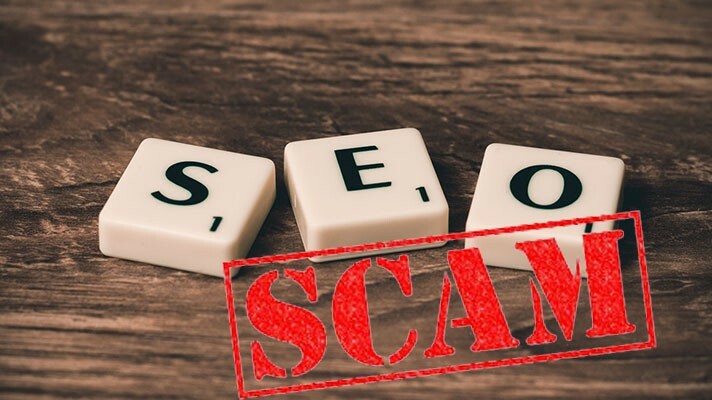 SEO (search engine optimization) scams are a dime a dozen. Thousands of folks on the internet are telling you that they can make you “#1 in Google” if you buy their book, download a PDF, sign up to receive a USB, or pay them a certain amount each month. While this sounds great, you need to think twice about signing up for a product or service that you don’t fully understand. As someone who does search engine optimization for her clients, certain promises jump out at me as unrealistic or a scam. But I understand that not everyone keeps up with SEO or knows what exactly it entails, so I’ve broken down some of the big red flags I see every day when it comes to SEO. This is probably the most irksome SEO claim for me. There are so many questions you should be asking before paying for a product or service that promises this. There are a few reasons that this is a big red flag screaming SCAM!!! No one can guarantee a #1 spot on Google or any search engine. The algorithms are always changing, and the search engines don’t tell us what these algorithms are looking for. This is the equivalent of agreeing to send a Nigerian prince your bank account details so he can wire $1 million to your account. Everyone’s search results are different. My search results are generated using a combination of what search terms I’ve used, what websites I’ve been to in the past, where I’m located, whether I’m on a desktop or mobile, and on and on. So on whose search results are you going to be #1? Your own? Theirs? And for how long? You’re going to be #1 in Google for what search term(s)? Your website should always be #1 in Google for your company’s name. In fact, Google “FGM Internet Marketing” right now. AMAZING – my website is #1!! The assumption is that you’ll be #1 on Google for a search term like “website development”. But never make assumptions. Look at the claim – they never define what you’ll be #1 for. That’s important. Are they actually selling SEO, which involves working on your digital footprint and content, or Google Ads? Google Ads are a form of paid advertising, and they work great, but this is not search engine optimization. Search engine optimization is working towards getting your website higher in the organic results, not in the ads listings. Google does not support SEOs directly. In fact, Google looks down on people who try to create a website specifically for search engine rankings. Direct from Google, “Google never accepts money to include or rank sites in our search results, and it costs nothing to appear in our organic search results.”[i] There is a program for advertisers called Google Partners, but this designation is for agencies who have demonstrated skill and results within Google Ads (formerly AdWords). FGM Internet Marketing is a Google Partner. No one has looked at your website and they certainly haven’t run an audit on it. This is a phishing scam devised to scare you into returning their email. I get these calls, too! If you’re on Google My Business (see our blog about GMB), your listing doesn’t expire. No one from Google will call you to update your listing. And notice that these callers don’t identify themselves when they call. If they do, their business name is something like “Local SEO Experts”. Avoid, hang up, and don’t listen to them. This claim appears in the description of what they are doing to rank your website. Guess what, there are only a few search engines that people use – Google, Bing, maybe Duckduckgo. It is in any search engine’s best interest to index all the pages on the internet, so eventually all search engines will find your site and index it. Submitting your site to Google can speed up the indexing process (we submit our clients’ sites to Google), but saying you’ll submit the site to thousands of search engines is overkill and unnecessary. Stay away from anyone promising backlinks to your website. Backlinks are considered an SEO ranking indicator, but those that “guarantee backlinks” are likely involved in either paying for backlinks, or throwing links up on shadow domains. These tactics are considered “black hat SEO” and if Google sees this being implemented, they can remove your site completely from their search engine. The claims above tend to fall into what is called “black hat SEO”. Black hat SEO involves trying to beat the algorithm, or using tactics that are deceptive to get better rankings. “White hat SEO” is using fundamental, best practices to make your website and content more search engine friendly. SEO is a long game – nobody can or should guarantee instant results. Doing it the right way involves research, developing a strategy, and then implementing this strategy over months and years.